We all have been there, stressed out about finding the right gate on time. Navigating through an unfamiliar airport can be stressful and time-consuming. Even the most experienced passengers can get lost at airports as it is not always easy to keep track of directions in the complex airport terminal buildings. Knowing the right route to the right gate beforehand reduces stress when traveling. Streerpath Indoor Navigation solution allows passengers to enjoy full customer experience at airports with maximum free time. Time freed from looking for the right gate can be better used by exploring what the airport has to offer in terms of shopping, eating, working or just relaxing. At Steerpath we believe that a working indoor navigation solution is the foundation of an excellent customer experience at airports. With the Steerpath Digital Indoor Navigation solution you can provide your passengers with a digital indoor map that gives them an overall view of your airport. Passengers can make the most of their time at airports when they don’t have to worry about navigating through it. The Steerpath Digital Indoor Navigation Solution helps your customers to find their way smoothly to the right gate on time without worrying about missing the flight or getting lost. Indoor navigation also helps passengers to discover what is around them and to find what they need whether it is a coffee shop or an information point – or a missing fellow passenger. Steerpath Digital Indoor Navigation frees passengers’ valuable time at airports and makes their experience as pleasant as possible. Direct flights are not always available so catching a connecting flight is an integral part of a contemporary traveling experience. This can be stressful and add confusion if the passenger does not know where the connecting flight is going to depart from. The Steerpath Digital Indoor Navigation solution helps passengers taking connecting flights find their way to the right gate on time. By using their smartphones they can navigate easily through the airport. Indoor navigation does not only improve the passengers’ experience. It also increases the turnover of the airport. Helping passengers to navigate easily through the airport releases time to enjoy the shopping, dining and pastime activities available. 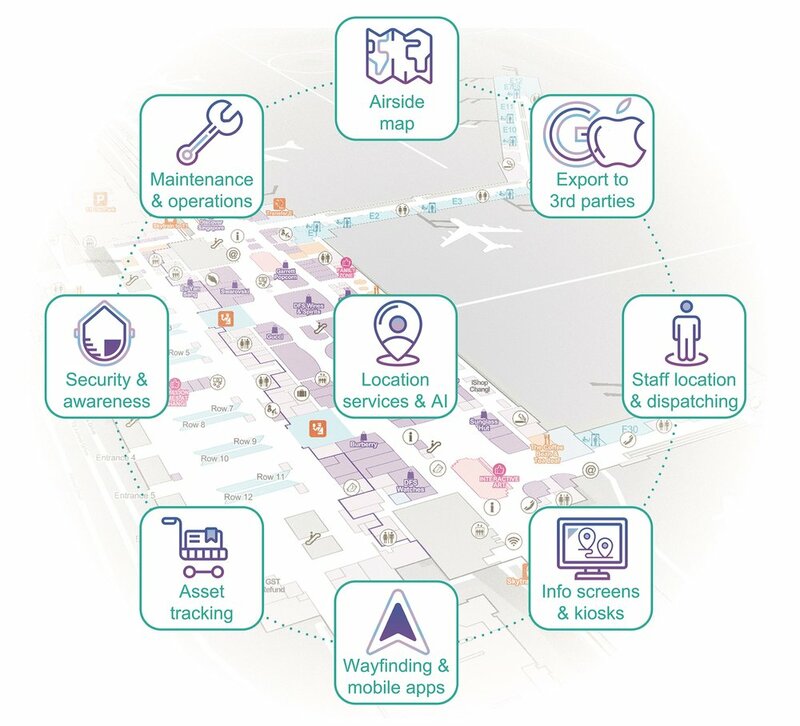 Thanks to indoor navigation, passengers will spend up to 30–50 % more time in the shopping areas of the airport which leads to better turnover. Geolocation for task management allows employees and contractors to “draw” and annotate information on top of one common map and have those notes and changes shared with other users of the map platform. Seeing where security team members, firemen etc. currently are. This makes dispatching tasks more efficient. Passengers communicating through mobile apps (airline or airport app) about their problems such as difficulty to reach the gate on time. By knowing the location of a distressed passenger the airport & the airline can do fact based decisions whether to pick up the passenger, wait for them or to close the gate.